Thin kerf requires less power and allows for faster feed rate. Ideal for saws under 3 HP. Laser cut anti-vibration slots reduces the vibration that resonates in standard blades extending the blade life. Tri-Metal Brazing for impact-resistant tips and precision tensioning keep the blades flat and true. I've been an amateur woodworker for 25 years and in the last 5 or 6 years gotten into more and more projects that require the "right tools". I bought this blade 4 years ago when it first went on sale in our local area and I love it! Cuts whatever I feed into it with no difficulty and leaves a glass smooth edge. A little pricy in my local area to sharpen but that's life. 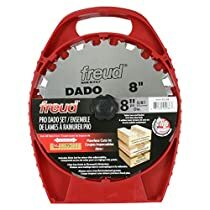 At this point all my blades are Freud and I'm a cheap SOB at heart so that's saying a lot. 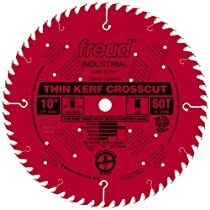 Most high quality crosscut blades cut cleanly but fall short in their ability to rip well or handle thick stock. The LU88 has some general purpose capabilities that many crosscut blades don't. It's tooth geometry features ATB carbide and a 15 degree hook angle that allow it to rip materials up to about 6/4" thick. Most crosscut blades have a very low or even a negative hook angle, which provides a polished edge, but it also causes burning on almost any rip cuts. The LU88 is alot more versatile than most crosscut blades and cuts just a bit cleaner than my Forrest WWII. If you don't need to do alot of heavy ripping with it, I think you could do nicely using just this one blade. It's thin kerf design makes life pretty easy on my saw's motor too. Very nice blade, and priced pretty reasonably. I'm finding this blade tough to beat for the price. Crosscuts are easily as clean as my Forrest's at about half the price, and it rips better than other crosscut blades I've used. In fairness, my Forrest rips thick material better. The LU88 has large teeth, Frued's best carbide, anti-vibration slots, and teflon coating. Great for crosscutting and general purpose use on a TS, but I wouldn't recommend it for a CMS or RAS because of the aggressive hook angle.